Shame you didn't dig it a little more rG, it was never the overt violence with this film (although as you say the beheading is spectacular) but the scuzzy feel of it. The fact the poster is a little misleading only makes it feel like more Grindhouse to me. Completely agree about Steve James though, it would have been more fun the other way around. As far as the violence goes, I think I was gauging that solely on most other peoples reactions and reviews, so I think my expectations were a little high. And I agree, they were going for the scuzzy Grindhouse feel and it does succeed part of the time, but then there were times where it looked and felt like another film altogether and my biggest problem with it, looking past the violence, was that it was so uneven most of the time. It reminded me a lot of William Lustig's Vigilante. It had the right look and feel most of the time and all the ingredients were there, but fell short of it's goal. That is a badass poster though! And I'm still looking forward to checking out part 2 pretty soon. It is a weird movie indeed. I dont knwo if uneven is the word, but its a weird one. The lack of a more straight forward plot and the weird end, that to me felt like there are 20 minutes missing of him getting the ones who shot at him. The second part is even weirder, but I could imagine you`d like that part more...This film has its moments, but at the end of the day it feels a bit aimless. Ingo, I have to agree with you on all points with this one. It had it's moments, but not enough of them for me to look past the disjointed plot and unsatisfying ending. Still haven't gotten around to watch this one. I know what you mean though about b-movies promising more than they deliver. Goes with the territory I guess. You know, it's not horrible. As A Hero Never Dies says, it has that early 80's scuzzy Grindhouse feel to it, but I just can't help but think that they coulda done so much more with it. I'd be interested on your take on it though. Yeah I think I'll get round to it some time this year. 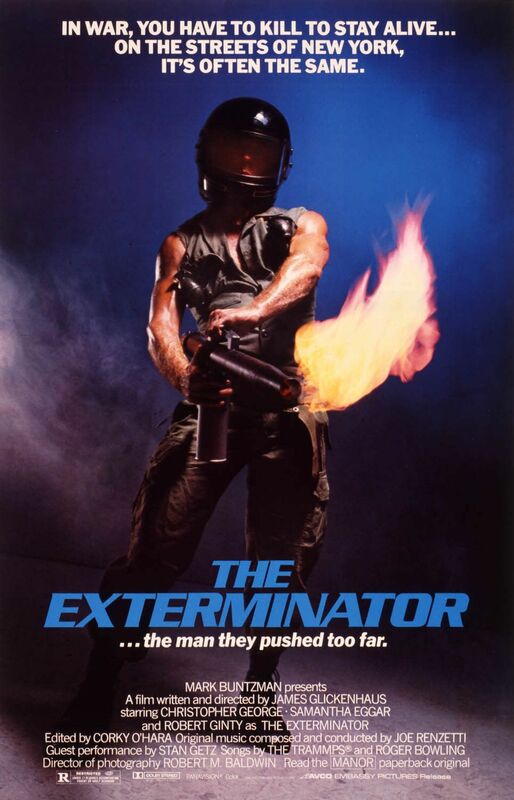 I'm hoping to do an article doing a rough guide to Cannon films and this is one of their most famous/infamous. Dude, I can't wait for you to publish that sucker. I'd be all over it! Everything A Hero Never Dies said and then some. Good review! That is interesting you didn't like it that much. There are some flaws especially in underusing Steve James. The opening is excellent though. Dude, trust me. I'm just as shocked as you are. I really, really wanted to like it, and I was so stoked to finally get a chance to sit down and watch it. But I don't know, it just didn't work all that well for me, even though it had some pretty badass scenes. I can't begrudge you your opinion on this robotGEEK, because it sounds like you did have fun with it, just didn't think it was the end-all-be-all that people often write about, and I think I feel the same way. But I did think it was sufficiently brutal, even if that brutality was spaced out. Finally got around to watching this film this afternoon. Yeah, it was kind of a letdown. The plot was really disjointed and the action was pretty weak. Nowhere near as satisfying as Death Wish 3 or 4. Ginty is no Bronson. Oh well, still going to try and track down the sequel. Heard it's more crazy. This movie is pretty terrible. Disjointed, non-ending,, basically just some random scenes that sort of happen. The opening is pretty cool, but thats it. Glickenhaus is a generally awful director, look how he handled Jackie Chan.